The UAV sector is changing rapidly with new technology every month, and with limited knowledge is it easy to get it wrong. We understand it, and can ensure you get it right - FIRST TIME! Having built numerous client solutions, we understand the technology, CAA regulations and have the experience to integrate whatever solution you require..
Where you want traditional photographic stills or Ultra HD video footage we have dedicated ultra stable aerial platforms and can assist with the post production. We are specialist in aerial inspection and coupled with our construction background can offer support services to suit your needs. Either horizontal or full 360 x 180 panoramic shots taken from a variety of different viewpoints all linked together into a virtual tour, and with regular visits offering historic review. By stitching lots of hi-res images together, then correcting them orthographically we can create very high resolution images of key locations for survey or mapping use. UAVs allow a very cost effective way to use photogrammetry to create either low resolution cloud point data to low polygon meshes for GIS and survey analysis. Create Digital Terrain or Surface models to 3D representation of the surface area that has been geometrically corrected and used for spot height analysis.  We have built the UK's most accurate UAV based LiDAR scanner for cloud point data capture. With an accuracy that is accepted as survey grade and can be used for engineer and design work. Offering solutions for Ground Works, Roads, Drainage, Sewerage, Treatment Plants, Infrastructure Works, etc. using various solutions from topological surveys to CAD drawings. Our team of 3D modellers and designers who specialise in construction, offer innovative and informative solutions from supporting bids to communicating logistical issues. Producing informative, concise and targeted corporate applications and videos for inductions, training and Sales & Marketing. Photogrammetry has been the mainstay of the mining industry offering topological and volumetric data, now with our UAV based LIDAR system can offer enhanced data sets for more exhaustive reporting. Industry specific challenges where normal access is hazardous or difficult, the use of UAV systems allows a vast array of cost effective data from a safe area. Working with key Rail Operators offering visual inspections to highly accurate cloud point capture without track possessions across the UK and Europe. The use of UAVs to detect early component failures, typically whilst in operation, saves considerable costs, through remote and thermal inspection. Working with International clients on a range of UAV based systems with specialist payloads from thermal/IR to specialist Corona UV sensor systems. The use of agile UAVs allows remote access to dangerous or difficult objects allowing a fast and flexible way to gain valuable visual information on the integrity of the asset. Low altitude and fast data acquisition time means UAVs are used widely for GIS surveys,to gain geo-referenced high-res imagery even when traditional aircraft can't. With thermal imaging camera and live video transmitted back to the ground station, UAVs are being used as rapid cost effective inspection tools for wind and solar farms. Mineral and mining companies are using airborne UAVs to give them frequent accurate volumetric data to explosives placement and service road gradients for fuel efficiency. With topological data, and suitable software systems the prediction of floods can be modelled and defence strategies defined. By placing a UV Corona camera system on a UAV with real-time video and control links remote monitoring of High Power Electrical lines can be inspected as close quarters. Communicating technical information via graphic representation cannot be underestimated. Be it a construction program, logistics strategy or method statement. With the advent of the UK Government's policy that all their future projects will use BIM. We have a team of BIM experts who work daily with our clients to deliver BIM compliant projects. With traditional surveying of viaducts a challenge, we worked with Amey to use UAVs to allow aerial inspection using panoramic cameras whilst keeping the railway line open. A test inspection to demonstrate to Network Rail the benefits of using aerial inspection by UAVs of dangerous and inaccessible depot roof structures. Our client requested a lidar scan of the construction site to allowing then to check volumetric data and use the model for client presentations and subsequent base for their BIM model. We supplied our first LiDAR UAV to a Chilean Mining company with our unique UAV designed specifically for carrying the VUX-1 Lidar scanner with multiple redundancy systems. Working with Network Rail to develop and highly accurate personal warning device to ensure that the workforce is individually alerted if they stray into a dangerous area. The Bionic Eye contact details, location, email and telephone. The Bionic Eye is a division of the Bionic Group, created to bring specialised technology and skills to the Rail, Utility and Construction sectors. Started by the same two industry pioneers who created the Bionic Group, this division has created a step change in how assets are accurately and cost effectively surveyed and managed. By combining the best cameras, bespoke rigs and image technology with unmanned vehicles (aerial, cable and ground-based) and our own pinpoint modelling technology we offer a wide range of industry-specific solutions crafted to our clients specific individual needs. Constantly pushing not only the bounds of technology but also pioneering the use of unmanned vehicles for access to difficult, dangerous or otherwise expensive assets. From our creative background in the film industry we genuinely feel we can produce the most stunning visual imagery and are sure we have the UK's only survey grade, aerial LiDAR solution. We are also working with world leading equipment manufacturers to build bespoke aerial systems for their equipment, either in a consultancy role or as a manufacturer. Please read our case studies to see examples of our work and/or register to experience BE.3DAM.